The government requires hedge funds and wealthy investors that crossed the $100 million equity holdings threshold are required to file a report that shows their positions at the end of every quarter. Even though it isn’t the intention, these filings level the playing field for ordinary investors. The latest round of 13F filings disclosed the funds’ positions on December 31. We at Insider Monkey have made an extensive database of nearly 750 of those elite funds and prominent investors’ filings. In this article, we analyze how these elite funds and prominent investors traded US Foods Holding Corp. (NYSE:USFD) based on those filings. Is US Foods Holding Corp. (NYSE:USFD) a buy right now? Prominent investors are becoming hopeful. The number of long hedge fund bets advanced by 5 in recent months. Our calculations also showed that USFD isn’t among the 30 most popular stocks among hedge funds. Let’s take a glance at the latest hedge fund action regarding US Foods Holding Corp. (NYSE:USFD). At the end of the fourth quarter, a total of 41 of the hedge funds tracked by Insider Monkey were bullish on this stock, a change of 14% from the second quarter of 2018. 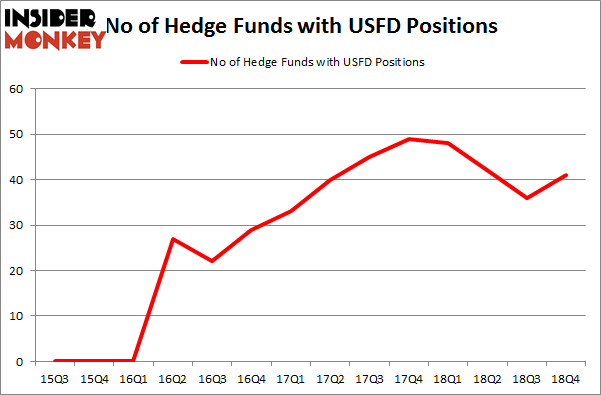 By comparison, 48 hedge funds held shares or bullish call options in USFD a year ago. So, let’s check out which hedge funds were among the top holders of the stock and which hedge funds were making big moves. Among these funds, Eminence Capital held the most valuable stake in US Foods Holding Corp. (NYSE:USFD), which was worth $198.1 million at the end of the third quarter. On the second spot was Sachem Head Capital which amassed $136.1 million worth of shares. Moreover, Nokota Management, Balyasny Asset Management, and Holocene Advisors were also bullish on US Foods Holding Corp. (NYSE:USFD), allocating a large percentage of their portfolios to this stock. As one would reasonably expect, some big names were breaking ground themselves. King Street Capital, managed by Brian J. Higgins, created the largest position in US Foods Holding Corp. (NYSE:USFD). King Street Capital had $38.1 million invested in the company at the end of the quarter. Matthew Iorio’s White Elm Capital also made a $7.4 million investment in the stock during the quarter. 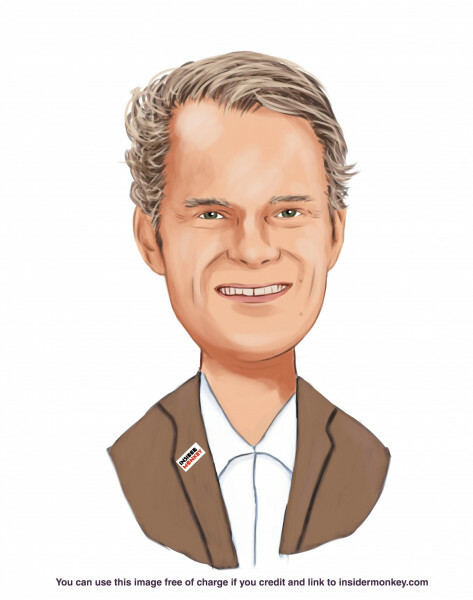 The other funds with brand new USFD positions are John Tompkins’s Tyvor Capital, Bart Baum’s Ionic Capital Management, and Anand Parekh’s Alyeska Investment Group. Let’s now take a look at hedge fund activity in other stocks – not necessarily in the same industry as US Foods Holding Corp. (NYSE:USFD) but similarly valued. These stocks are Apartment Investment and Management Co. (NYSE:AIV), Tallgrass Energy, LP (NYSE:TGE), Whirlpool Corporation (NYSE:WHR), and SCANA Corporation (NYSE:SCG). This group of stocks’ market caps are similar to USFD’s market cap. As you can see these stocks had an average of 19.5 hedge funds with bullish positions and the average amount invested in these stocks was $479 million. That figure was $1207 million in USFD’s case. SCANA Corporation (NYSE:SCG) is the most popular stock in this table. On the other hand Tallgrass Energy, LP (NYSE:TGE) is the least popular one with only 8 bullish hedge fund positions. Compared to these stocks US Foods Holding Corp. (NYSE:USFD) is more popular among hedge funds. Our calculations showed that top 15 most popular stocks among hedge funds returned 19.7% through March 15th and outperformed the S&P 500 ETF (SPY) by 6.6 percentage points. Unfortunately USFD wasn’t in this group. Hedge funds that bet on USFD were disappointed as the stock returned 9.9% and underperformed the market. If you are interested in investing in large cap stocks, you should check out the top 15 hedge fund stocks as 13 of these outperformed the market. Were Hedge Funds Right About Flocking Into Marvell Technology Group (MRVL)? Were Hedge Funds Right About Dumping Elanco Animal Health Incorporated (ELAN... Is Seagate Technology (STX) A Good Stock To Buy? Do Hedge Funds Love Lincoln National Corporation (LNC)? Hedge Funds Haven’t Been This Bullish On DexCom, Inc. (DXCM) Since 2015... Were Hedge Funds Right About Souring On Vornado Realty Trust (VNO)?